business partners on their resilience to cyberattacks. The company receives the supplier’s own personal and dynamic security proﬁle, reﬂecting a continuous 360 ̊ view of the supplier’s cyber posture. 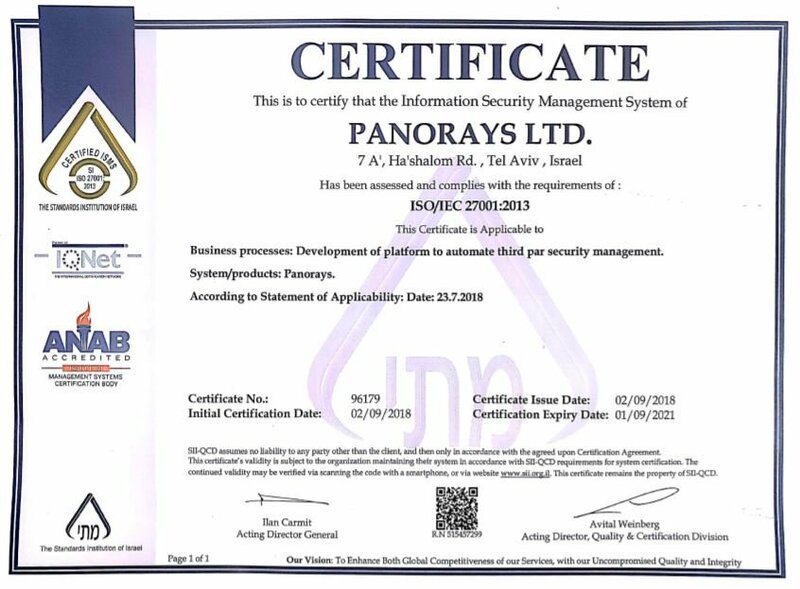 Panorays automatically evaluates the cyber posture of the company's supplier. of the hacker’s view and internal policy. hacker would evaluate a company. with security policies and practices. Using Panorays, we reduced supplier vetting from months to just a few hours. Better yet, the notiﬁcations in changes in cyber posture allowed us to take immediate action to work with a vendor. Panorays "is best for S&R [security and risk] pros that want a dedicated tool to conduct all cyber-TPRM [third party risk management] activity." Working with Panorays has simplified our supplier vetting process while boosting our cybersecurity standards. The result is that we feel more confident about working with our business partners and have more time to focus on our business. By actively engaging third-parties in the business cyber-security risk management program, Panorays uses the web of symbiotic relationships to create a broad ecosystem where all companies involved benefit from each other’s success in reducing risk. - David Monahan, Managing Research Director, Security and Risk Management, Enterprise Management Associates, Inc.